Since emerging from tabloid-television infamy as the former host of Inside Edition, Bill O’Reilly has taken his brand of provocative rhetoric to the next level: from shock-TV to the No Spin Zone. Despite his outspoken support for Bush’s tax cuts and a war with Iraq, and his attacks on everything from National Public Radio to "welfare mothers," O’Reilly fashions his program, The O’Reilly Factor, as "without an agenda or any ideological prejudices." Presenting opposing viewpoints and likely to express views that occasionally diverge from the conservative orthodoxy, O’Reilly has styled himself as a straight-shooting man of the people, wary of the conservative label with which liberals would tag him. In The Oh Really? 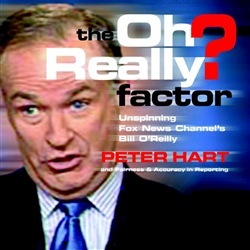 Factor, brimming with examples of O’Reilly’s error, contradiction, and hard-right political tilt, Hart exposes the No Spin Zone as little more than clever marketing. The Oh Really? Factor reflects hundreds of hours of research, fact checking, and analysis of the same evidence O’Reilly uses to support his claims. In this concise and compelling analysis of O’Reilly’s views, Hart underscores this pundit’s masked partisanship; adversarial stance toward unions, Blacks, immigrants, and gays and lesbians; and his kid-gloves treatment of the Right. Forming an important corrective, The Oh Really? Factor snags O’Reilly in his own spin. Acquista The Oh Really? Factor in Epub: dopo aver letto l’ebook The Oh Really? Factor di Peter Hart, Fairness and Accuracy in Reporting ti invitiamo a lasciarci una Recensione qui sotto: sarà utile agli utenti che non abbiano ancora letto questo libro e che vogliano avere delle opinioni altrui. L’opinione su di un libro è molto soggettiva e per questo leggere eventuali recensioni negative non ci dovrà frenare dall’acquisto, anzi dovrà spingerci ad acquistare il libro in fretta per poter dire la nostra ed eventualmente smentire quanto commentato da altri, contribuendo ad arricchire più possibile i commenti e dare sempre più spunti di confronto al pubblico online.